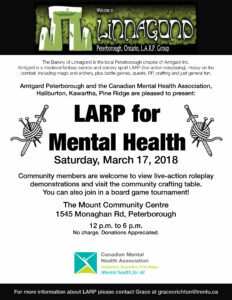 Amtgard Peterborough and the Canadian Mental Health Association, Haliburton, Kawartha, Pine Ridge are pleased to present LARP for Mental Health. Click here to download the poster for the LARP for Mental Health event. Community members are welcome to view live-action roleplay demonstrations and visit the community crafting table. You can also join in a board game tournament! There is no charge for this event but donations are appreciated. The Barony of Linnagond is the local Peterborough chapter of Amtgard Inc. Amtgard is a medieval/fantasy swords and sorcery sport LARP (live-action roleplaying). Heavy on the combat, including magic and archery, plus battle games, quests, RP, crafting and just general fun.